This cam meets lift requirements for box stock but has a lot of extra duration keeping the valves open longer, produces better horsepower over a broader RPM range than many other cams. Can use stock setup with this cam, but it works even better as a modified cam. This cam will easily allow your motor to turn up into the higher RPM range and will require upgraded spring package if your exhaust and intake systems are upgraded. 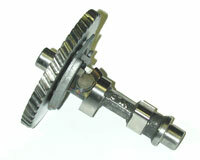 Billet rod and flywheel required for safety if engine is modified. 246 Duration on Intake at .050"
236 Duration Exhaust at .050"
Cheater/Hot Stock used with stock carb.